Congolese musician Redo Likinga Mangenza who is famous for his role as one of the lead vocalists of Zaiko Langa Langa died Thursday, Aug. 8 at the White House Hospital in Reims in France. He died after a cardiac arrest. He was 59 years old and had been suffering from Alzheimers disease for a lengthy period. Likinga was born on 15 March 1954 in Kinshasa. He began his career in 1968 within the group Malou in the town of Kinshasa. In 1971, he joined Empire Bakuba alongside Pepe Kalle, Papi tex Dilu Dilumona. In 1974, he was recuited by Zaiko Langa Langa to replace departing stalwarts like Papa Wemba and Evolocko Jocker. He immediately made waves with songs like Kamanji. At the time Zaiko were creating waves in the Congolse music scene with their unorthodox style which focused on up tempo tunes accentuated by the snare drum, discarding the horn section and emphasizing the solo guitar. They were the anti-thesis of traditional bands like Africa Jazz, TPOK Jazz and Afrisa National. And Likinga thrived in this role alongside Nyoka Longo, Lengi Lenga and Bimi Ombale. He composed one of the most famous Zaiko songs, Anitalia circa 1983. It was around this time that he was first arrested for drug trafficking in Portugal. He was jailed for 5 years. 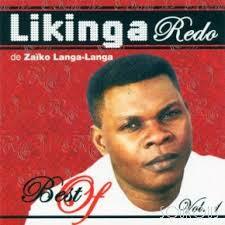 His friend Pepe Kalle composed the song Souci ya Likinga (Likinga’s problems) in 1986 while Likinga was in prison. He stayed in Zaiko Langa Langa until 1988, when he and others led an internal rebellion within Zaiko that led to the formation of the group Zaiko Langa Langa Familia Dei alongside other Zaiko stalwarts Ilo Pablo, Bimi Ombale and Lengi Lenga. The group subsequently won great success before breaking up during a trip across the Atlantic. Then begun Likinga’s European adventure where he was mostly a session musician. Starting in the new millennium, Likinga Redo focused on singing gospel music. He was accompanied by his spiritual brother Adjina Djuma – Pili. This entry was posted in Africa Music News. Bookmark the permalink. surely how liwa ya redo passed on a very low tone.the world never knew.RIP REDO. R.I.P.pesalanga mbote na pepe kalle,bimi ombale na ba musicians nionso.